VBConversions has the most accurate VB.Net to C# Converter money can buy. 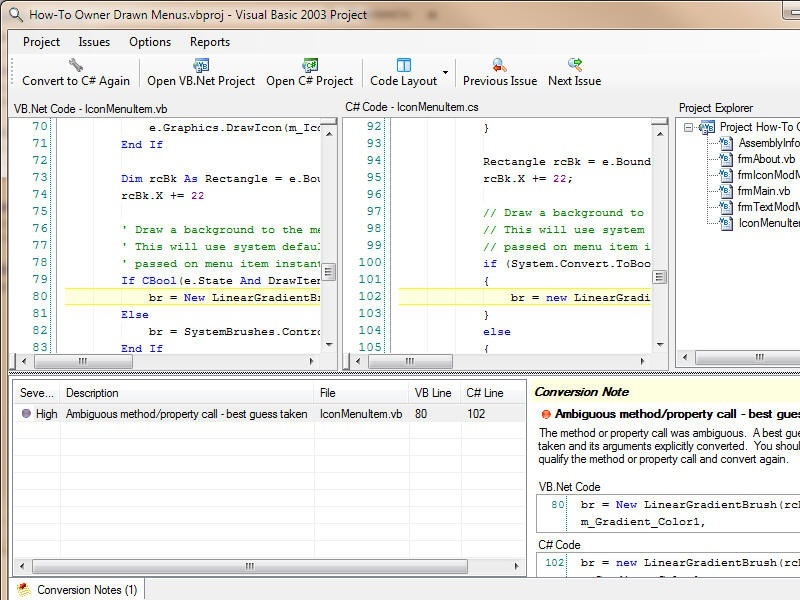 The VBConversions VB.Net to C# Converter will convert your VB.Net program to C# with over 99% accuracy. It won the coveted Visual Studio Magazine Reader's Choice Award in 2006 in the developer tools category. It was chosen by real world developers in the field just like you. Free Download. Some converters reverse engineer assemblies, producing unreadable assembly like code in C#. VBConversions VB.Net to C# Converter is a source code to source code converter. Your code maintains its original readability and flavor (including line and inline comments), Reliability is very good, over 99% accuracy in most tests. Don't take our word for it. Download the Free Version Today at www.vbconversions.net and check it out for yourself. Recent Changes: 01/12/2019 - VB.Net to C# Converter 5.06 Released! Includes many improvements!